More than 47,000 people were killed while walking in the U.S. between 2003 and 2012, a rate that has been rising in the last few years. The majority of those deaths could have likely been prevented with safer street design, according to Dangerous by Design 2014, a new report released today by the National Complete Streets Coalition, a program of Smart Growth America, in conjunction with AARP and American Society of Landscape Architects (ASLA). The report also ranks America’s major metropolitan areas according to a pedestrian danger index that assesses how safe pedestrians are while walking. The four most dangerous — Orlando, Tampa, Jacksonville, and Miami — are all in Florida. The others in the top-10 most dangerous list are: Memphis, Phoenix, Houston, Birmingham (new to this year’s top 10), Atlanta, and Charlotte. The report presents data on pedestrian fatalities and injuries in every U.S. metro area, as well as state by state assessments and an online, interactive map showing the locations where pedestrian fatalities have occurred. More than 676,000 pedestrians were injured over the decade, equivalent to a pedestrian being struck by a car or truck every eight minutes. That rate increases significantly for more vulnerable populations such as older adults, children, and people of color. Children 15 years and younger represent a significantly at-risk population, and fatal pedestrian injury remains a leading cause of death. Between 2003 and 2010 (the most recent year for which data is available about children), 4,394 children were killed while walking. Among people of color, blacks and African Americans suffer a pedestrian fatality 60 percent higher than non-Hispanic whites, and Hispanics of any race have a rate nearly 43 percent higher. The majority of pedestrian deaths occur on roadways that encourage speeding, and speeding is a factor in nearly one-third of all traffic fatalities. 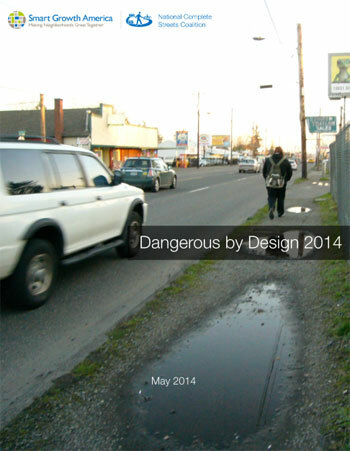 The report finds that these deaths can be prevented through changes to the design of our streets: providing sidewalks, installing high-visibility crosswalks and refuge islands, and calming traffic speeds. This has proved true for roads such as NE 125th St. in Seattle, WA. In 2011, the city added a marked crosswalk, reduced the number of travel lanes, and installed bike lanes, along with other measures, to provide for the safety of pedestrians in a high-crash corridor where 87 percent of drivers were speeding. The modifications have reduced the rate of collisions by 10 percent and speeding by 11 percent and led to more people walking and biking along the roadway. Increase the available funding and maximize the use of existing federal programs for walking and bicycling projects. Adopt a complete streets policy and comprehensive implementation plan. Emphasize walking and bicycling in the strategic highway safety plan (SHSP). Reform measures of congestion, such as level of service, to account for the needs of all travelers. Update design policies and standards. Standardize and gather more comprehensive data on pedestrian crashes. Give local cities and towns more control over their own speed limits. Encourage collaboration across transportation, public health, and law enforcement agencies.